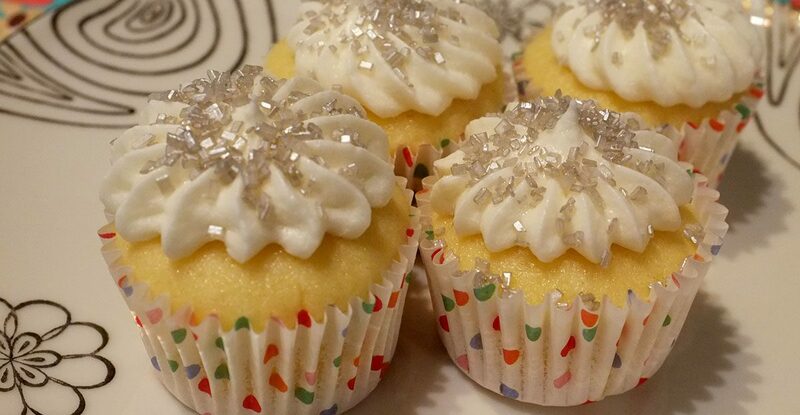 These entries include links to recipes I used or modified to bake my cupcakes or make frosting. 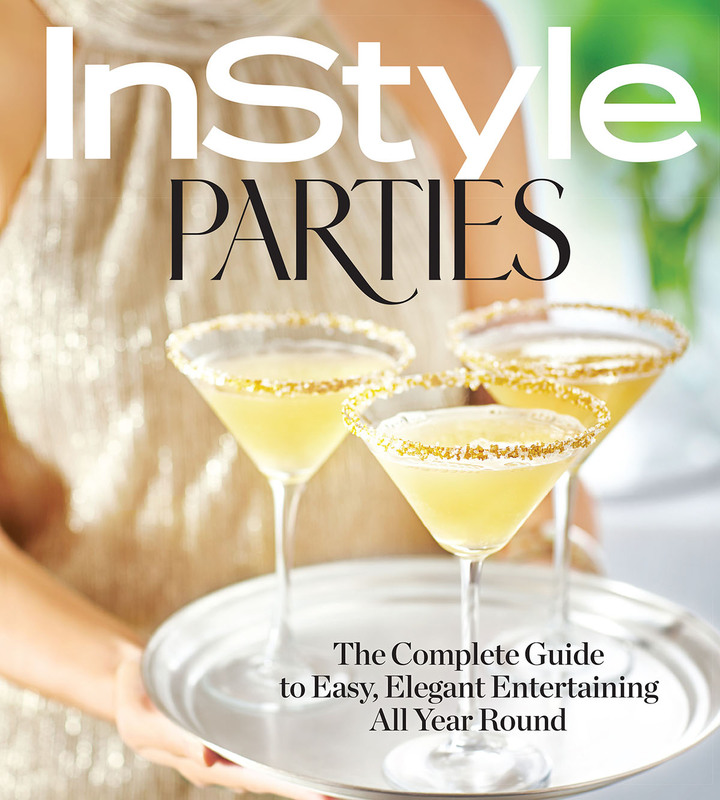 InStyle Parties: The Complete Guide to Easy, Elegant Entertaining All Year Round is a great resource for those who like to entertain. We all need a little guidance sometimes, or just some new ideas. The book starts with a general guide to invitations, food and drinks, setting the table (serving pieces to linens) and the atmosphere (flowers, music, lighting). There is a wide variety of party ideas including dinner, holiday, occasions/themes, and summer. Each suggests an invitation design, décor, menu, and even an activity. They provide recipes for everything and sneak in shortcuts if you don’t have time for the full deal. Since the Super Bowl is almost here, I chose to bake the brownies from the “Game Day Fiesta” section of the Occasions & Theme Parties chapter. I have to admit, I haven’t made a lot of brownies in my time. Most were probably from a mix–gasp! These were from scratch with three kinds of chocolate (semisweet and unsweetened bars plus cocoa) and were marvelous. 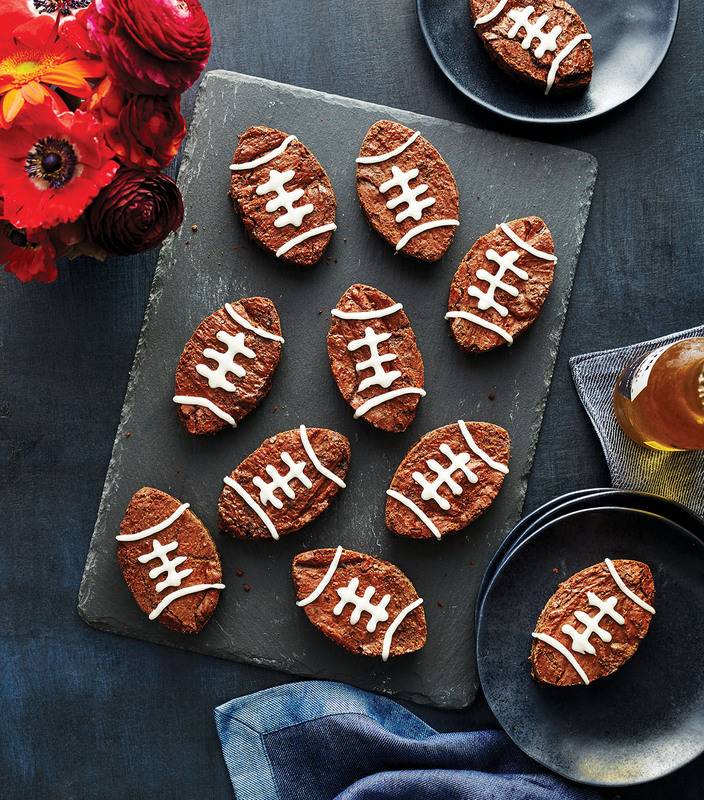 The hardest part is cutting out the football shapes, and the recipe doesn’t give much guidance here–cut 10 (4-inch) football shapes. 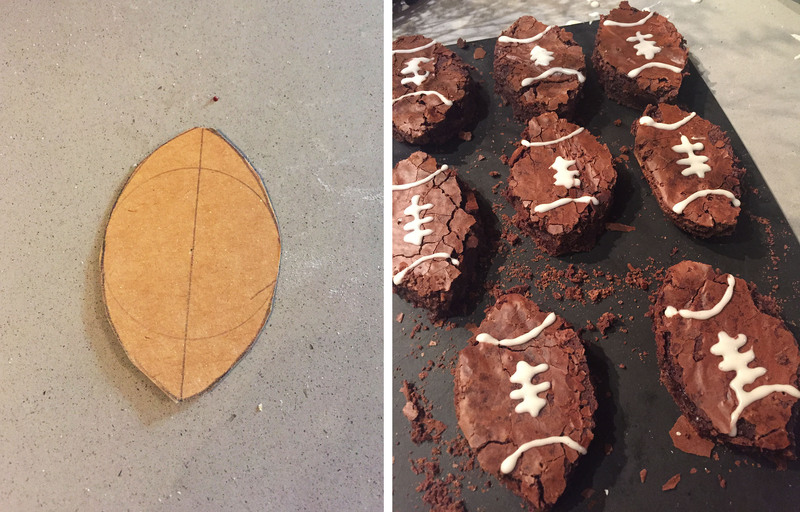 After I was disappointed by my freehand attempts, my husband looked up the exact proportions of a football and made a more precise pattern. 2 1/2 ” x 4″ is the correct size. It’s still a challenge to cut out the shapes. Being careful not to disturb the crunchy top of the brownies (as much as possible) gives the best results. Excerpted from INSTYLE Parties by the Editors of INSTYLE. Copyright © 2017 Oxmoor House. Reprinted with permission from Time Inc. Books, a division of Time Inc. New York, NY. All rights reserved. Make the brownies: Preheat the oven to 350°F. Line the bottom of a 13- x 9-inch baking pan with parchment paper, and lightly coat with cooking spray. Place the semisweet chocolate, butter, and unsweetened chocolate in the top of a double boiler. Bring the water in the bottom pan to a light boil over medium. Cook the chocolate mixture, stirring often, until melted and smooth, about 10 minutes. Cool slightly, about 10 minutes. Whisk together the sugar, eggs, and vanilla in a large bowl. Add the chocolate mixture to the sugar mixture, stirring until smooth. Sift together the flour, cocoa, and salt. Stir the flour mixture into the chocolate mixture until fully incorporated. Spread the batter in the prepared pan. Bake at 350°F until a wooden pick inserted in the center comes out with a few moist crumbs, 32 to 35 minutes. Cool completely in the pan on a wire rack, about 2 hours. 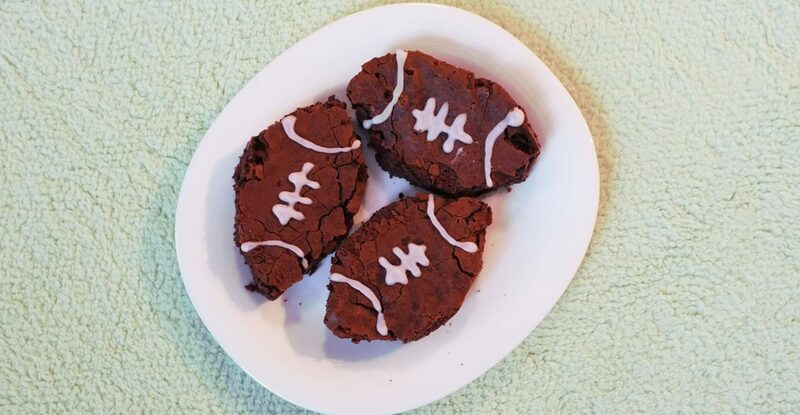 Turn the brownies out onto a baking sheet; cut 10 (4-inch) football shapes, reserving the scraps for another use. Make the icing: Whisk together the powdered sugar, vanilla, and 1 tablespoon of the milk in a medium bowl until smooth. Whisk in the remaining milk, 1 teaspoon at a time, to the desired consistency. 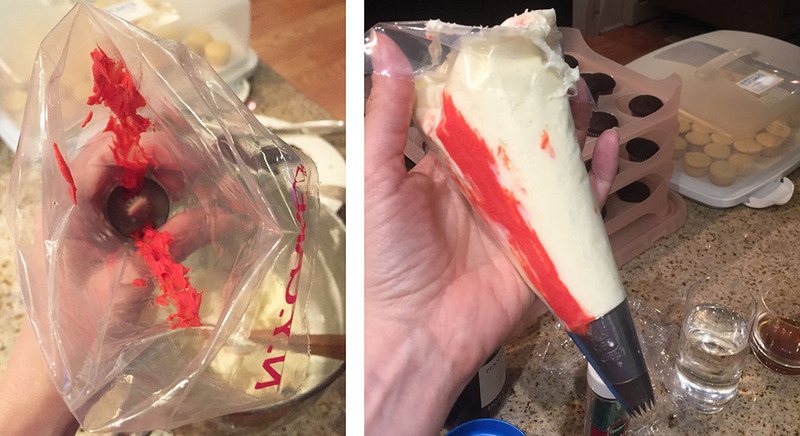 Spoon the icing into a piping bag or a ziplock plastic bag with 1 corner snipped. Pipe the football stripes onto the brownies. Let the icing set before serving, about 20 minutes. Thank you to Time Inc. Books, from whom I received a review copy of this book. 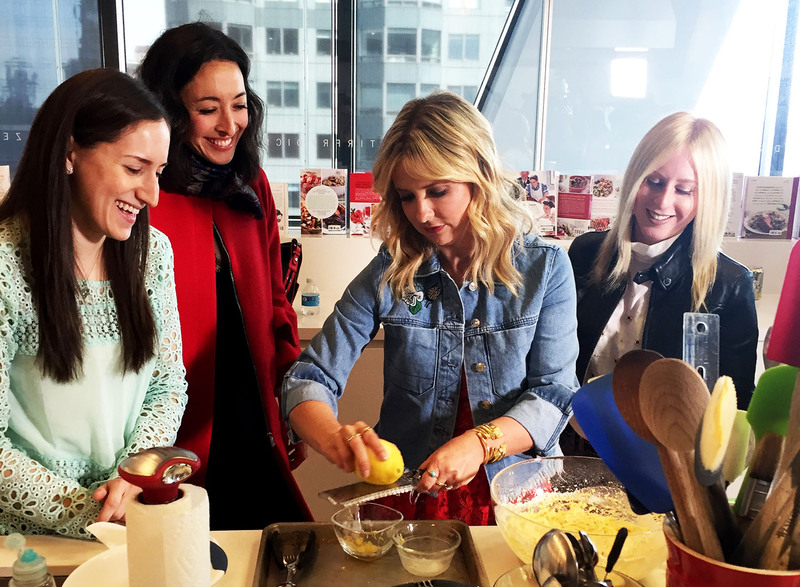 I had the opportunity to help bake cupcakes from Sarah Michelle Gellar’s new cookbook, Stirring Up Fun with Food yesterday. 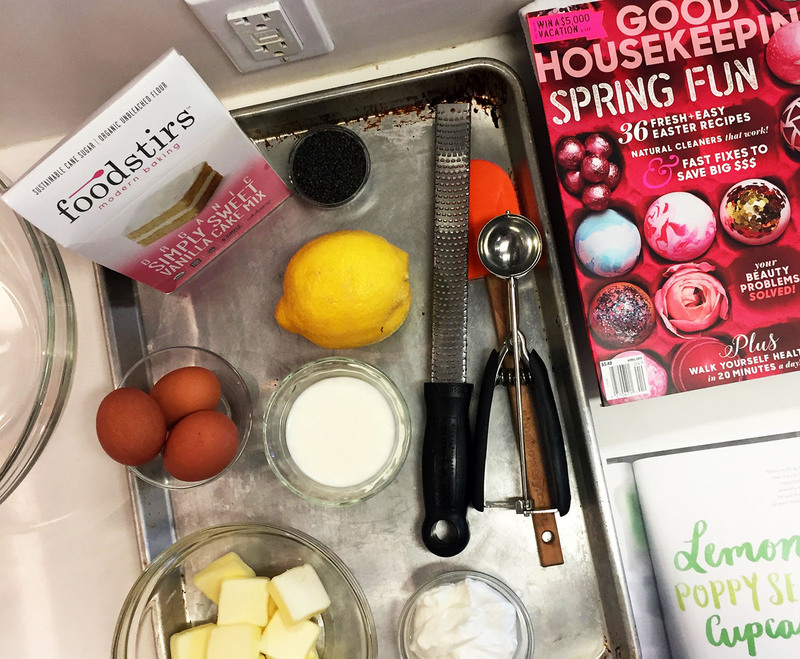 The book is full of fun recipes from S’mores Parfaits to Asparagus Fries (one of Sarah’s favorites) to Green Eggs & Ham, but I was delighted that the Lemon Poppy Seed Cupcakes were the pick. 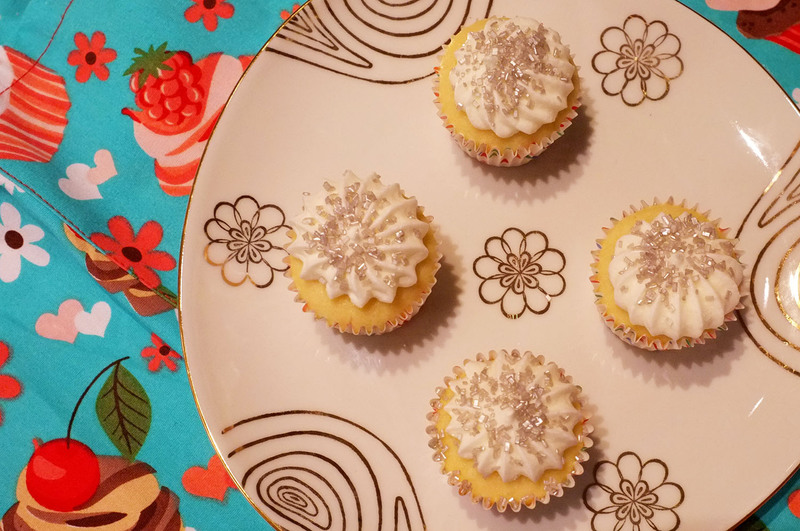 These cupcakes are based on Foodstirs cake mix plus lemon pudding, poppy seeds, and lemon zest. The former star of Buffy has been focusing on food these days, starting her organic baking kit company Foodstirs in 2015. She wrote this book with Gia Russo to highlight being creative in the kitchen. 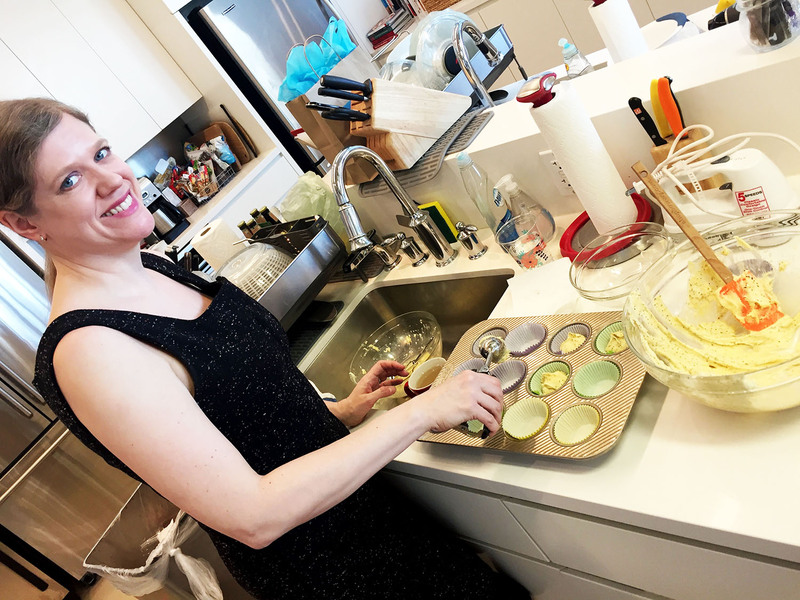 Having fun with food is a great creative outlet for everyone, and a good way to spend time with children while teaching them–and yourself–to be fearless cooks. 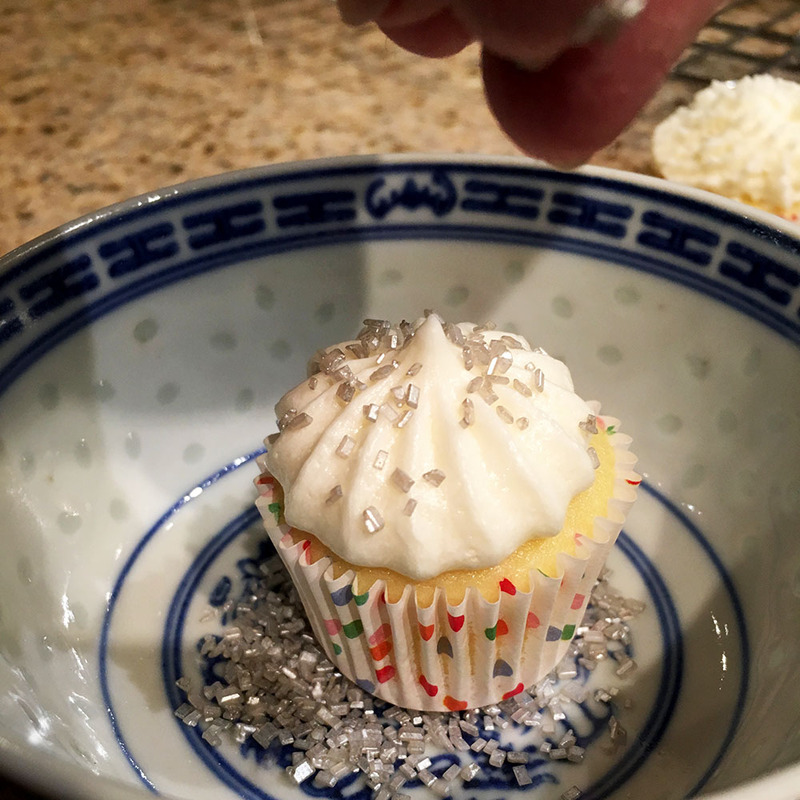 Sarah likes to zest a whole lemon, using half for the cupcakes, half for the frosting. 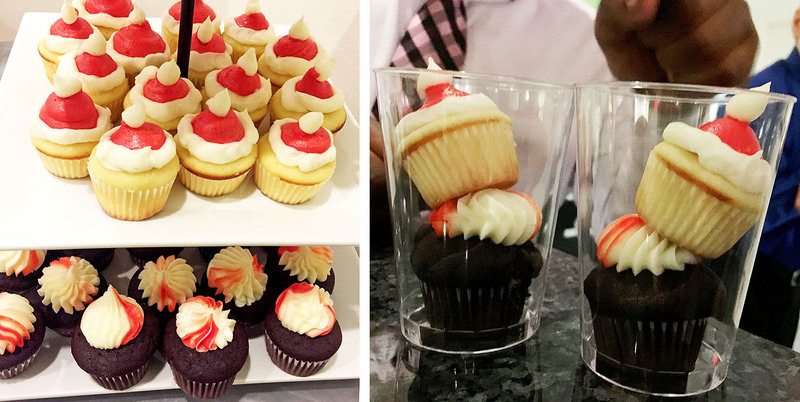 These cupcakes smelled so good while baking, it was almost distracting from the rest of the event! 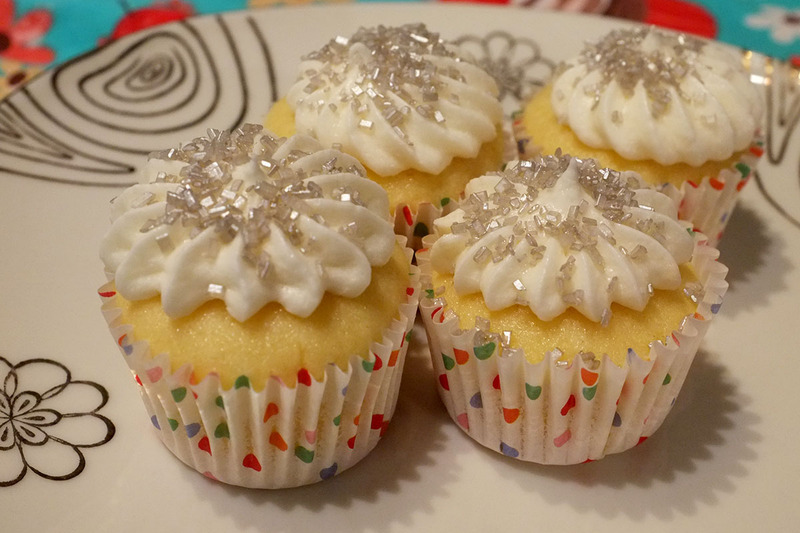 I love lemon cupcakes, and these tasted great. Using a quick-from-scratch method (ie. starting with Foodstirs cake mix) was nothing like using a typical mix. The taste was all homemade. I can’t wait to delve deeper into the book. Stay tuned for future posts, as I have a chance to test more of the recipes and food crafts like Grilled Cheese Dippers and Palm-Size Cherry Pies. Thank you, Good Housekeeping, for hosting this event. Baking in your test kitchen was a real treat! Stirring Up Fun with Food, by Sarah Michelle Gellar and Gia Russo, is available today from Hachette Book Group. See page 88 for this cupcake recipe. Baking with bubbly! What better way to ring in the new year? 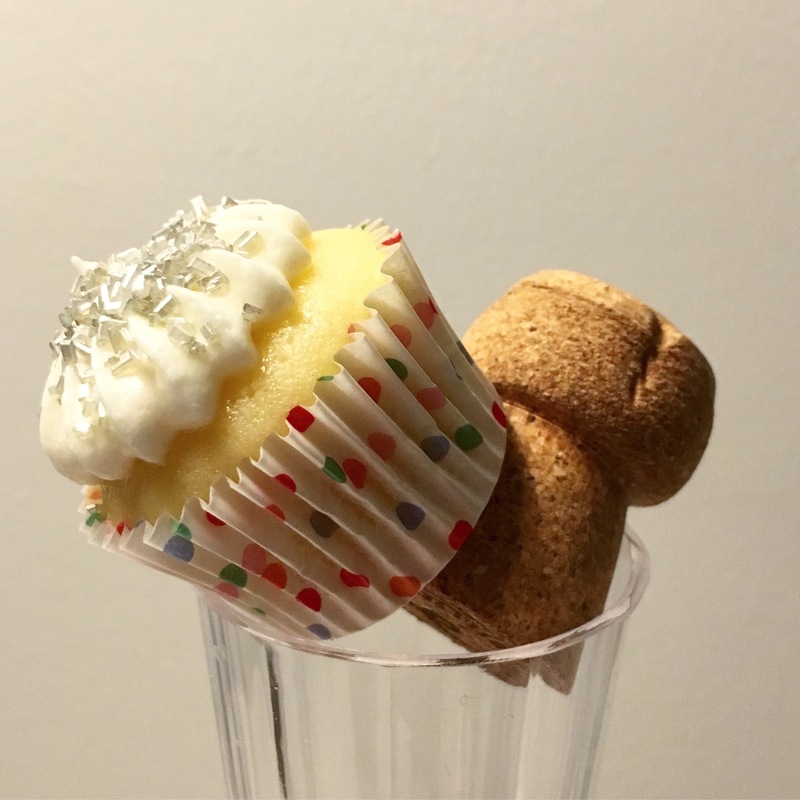 For these mini treats, I reduced champagne to use as the flavoring. I used inexpensive André, a California sparkling, keeping the good stuff to drink! The actual bubbles can be problematic, and intensifying the flavor is no bad thing, so I recommend this rather than using champagne straight from the bottle. This recipe makes for tasty cake and frosting. The champagne flavor is subtle, but there is a hint of that celebratory beverage. 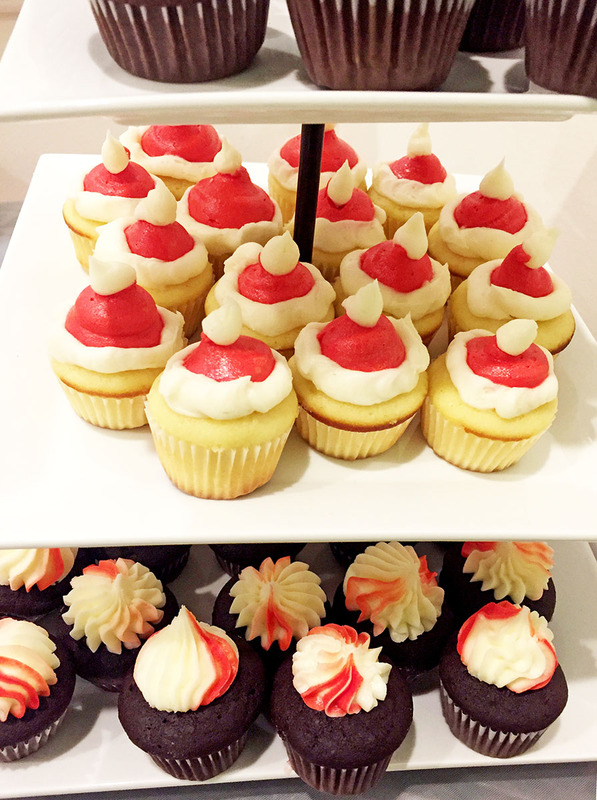 Champagne cupcakes are perfect for New Year’s Eve, engagement parties, birthdays, or any other bubbly-worthy occasion! First, reduce 1 cup of champagne to 1/2 cup by boiling in a small pan on stovetop. Let cool. Preheat oven to 350 degrees F. Line muffin tin with paper liners. Cream the butter and sugar at medium speed, then reduce to low to add the eggs one at a time. Alternate adding the flour mixture and the yogurt, beginning and ending with the dry ingredients. Mix until just combined, do not overmix. 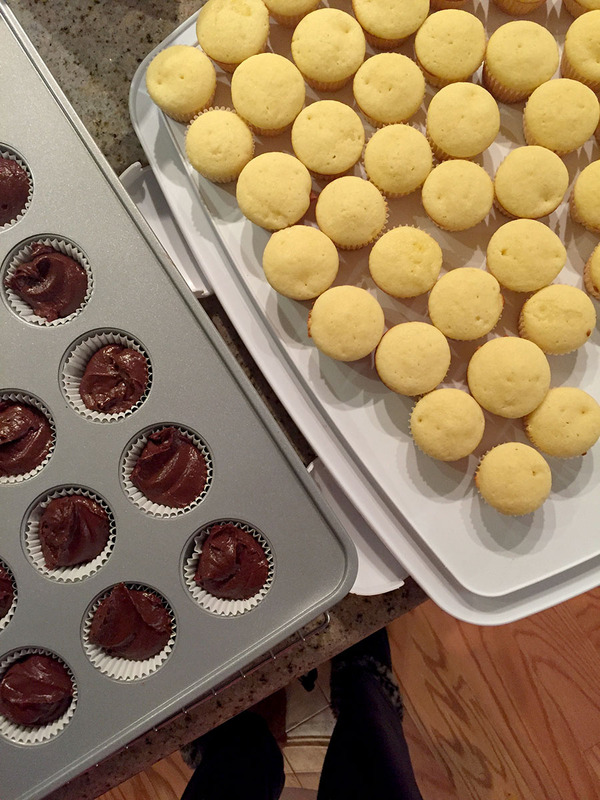 Scoop into lined tins and bake for about 20 minutes (10-12 minutes for mini cupcakes), turning halfway through. Remove from oven and let cool in pans for 5 minutes. Cool on racks until room temperature before frosting. 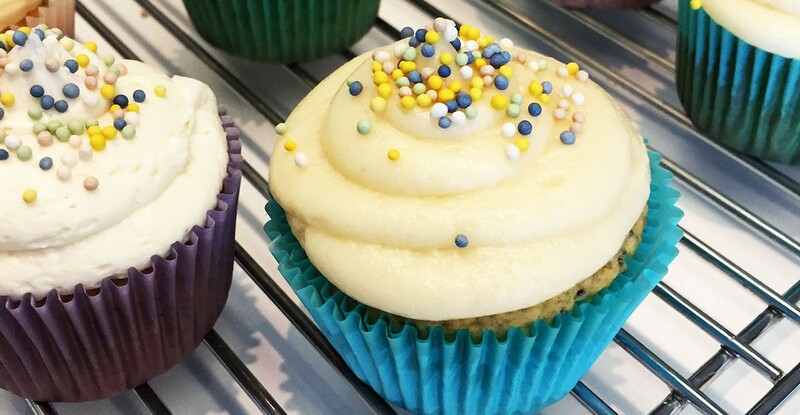 For frosting: Beat the butter until smooth. Slowly add half the powdered sugar, then 3 tablespoons reduced champagne. Add the rest of the powdered sugar and mix, adding more champagne if needed to reach desired consistency. One way I love to get into the Christmas spirit is to do some holiday baking! 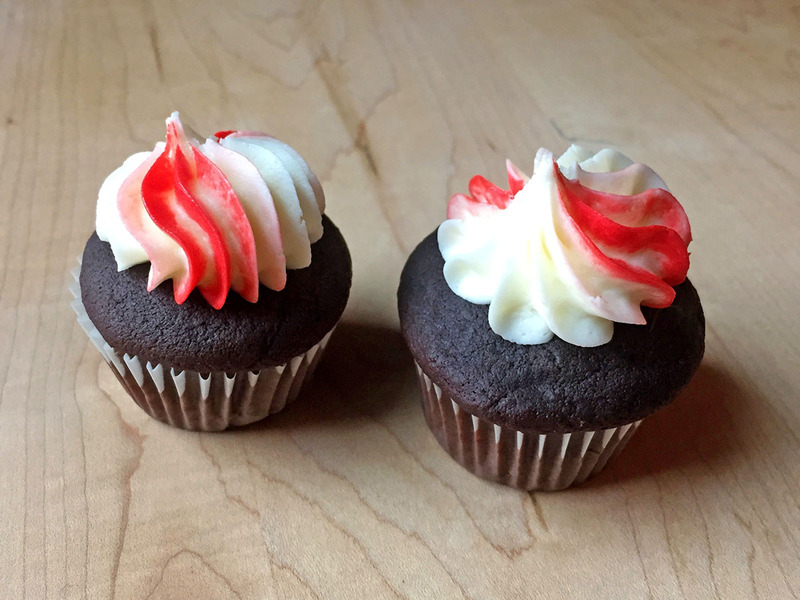 My office requested cupcakes for its annual holiday party, so I decided to make peppermint cupcakes–both chocolate and plain peppermint. 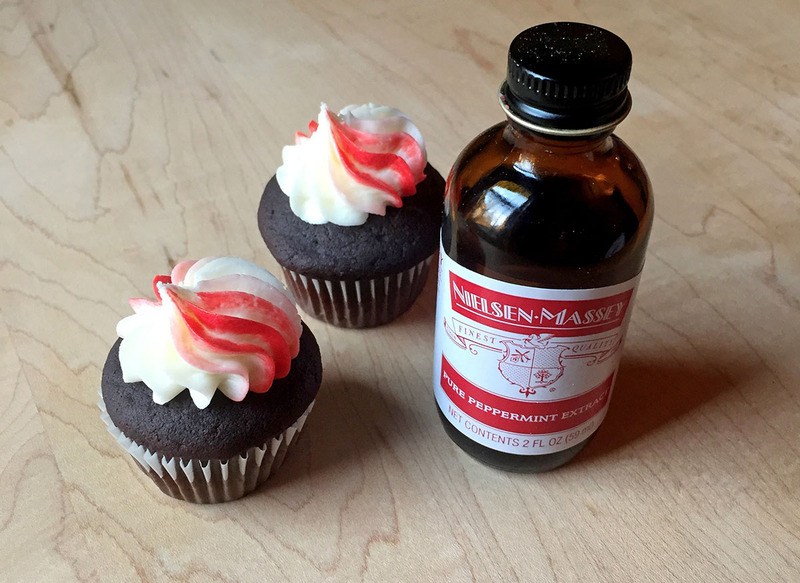 I baked minis with my regular chocolate cupcake recipe, substituting Nielsen-Massey Peppermint Extract for half of the vanilla and using a teaspoon of Nielsen-Massey Chocolate Extract instead of the brewed coffee. Pure Peppermint Extract pepped up my chocolate cupcakes and made for a delightfully pepperminty buttercream. The Chocolate Extract worked with the cocoa to make the cake extra flavorful. 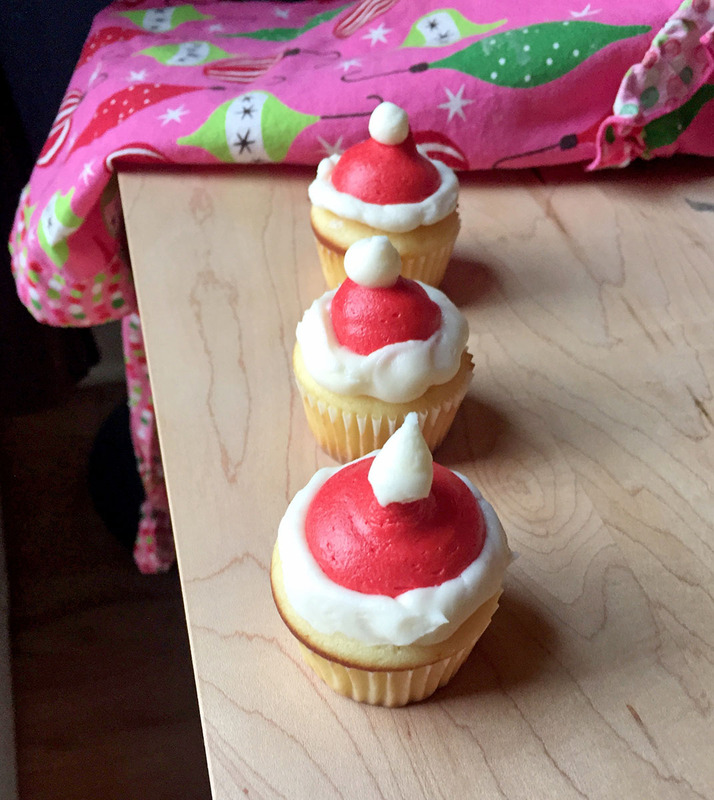 I also made plain peppermint cupcakes, see recipe below! 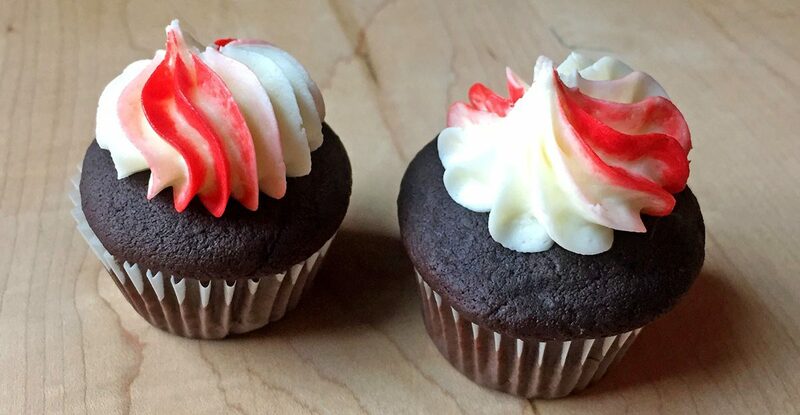 To make the red and white striped icing for the chocolate peppermint cupcakes, I painted two stripes of red icing down the piping bag (I used a chopstick). I then carefully filled with white icing. It had a nice striped effect when I piped. 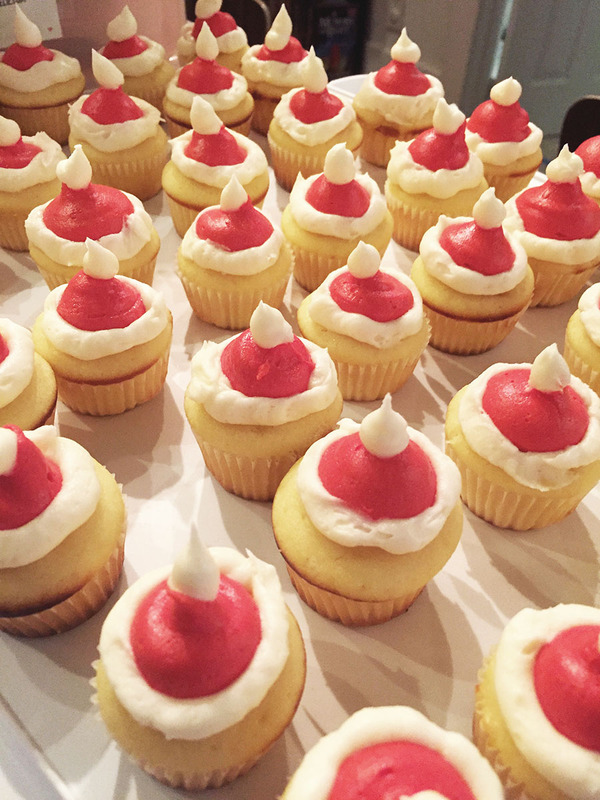 For the plain peppermint cupcakes, I made “Santa Hats” by piping a smooth swirl of red icing, then filling the base with white and a little ball on top. 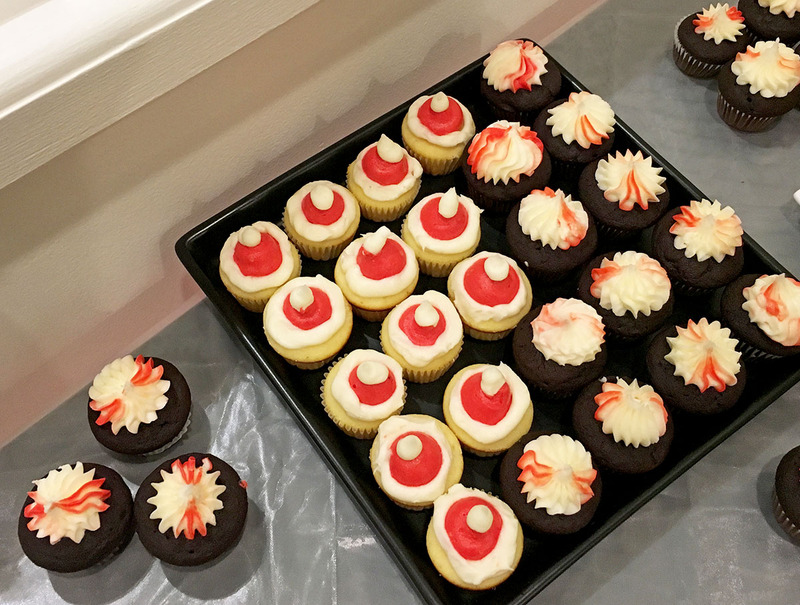 They were festive additions to the party, where they were a sweet hit! I packed extras in plastic party cups for guests wanting to take a few to-go! Thank you to Nielsen-Massey Fine Vanillas & Flavors for the chocolate and peppermint extracts! Nielsen-Massey uses premium ingredients sourced from around the world to craft their all-natural pure flavors. Learn more at www.nielsenmassey.com. 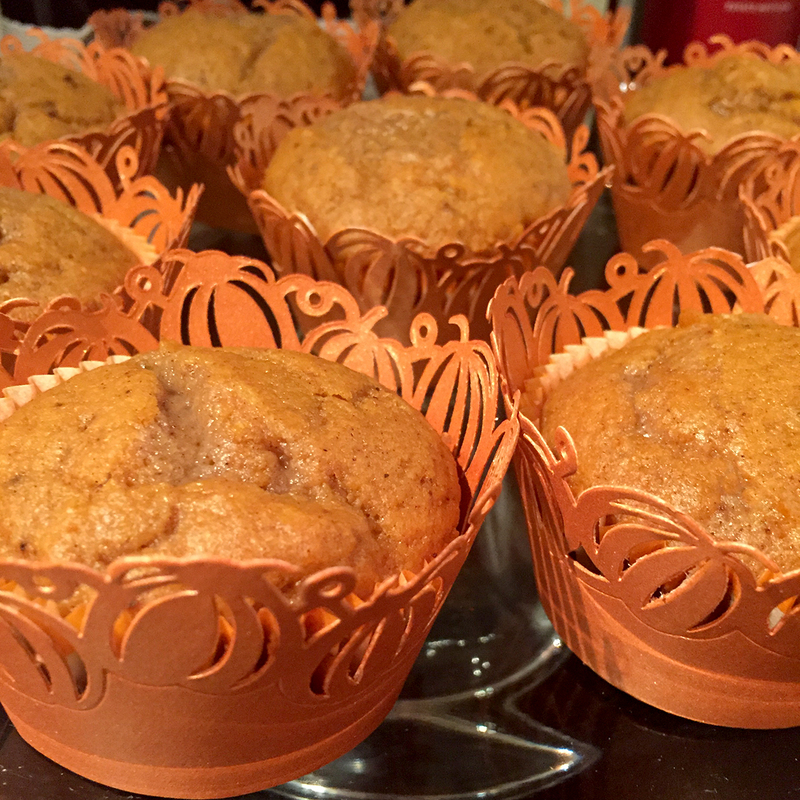 Preheat oven to 350 degrees F, and line mini muffin tins with paper cupcake liners. Cream the butter and sugar at medium speed, then reduce to low. Add the eggs one at a time, then the peppermint extract. Mix in the dry ingredients gradually, alternating with the sour cream, until just combined (don't overmix). Scoop batter into lined muffin tins and bake 10-12 minutes, rotating halfway through. Baking time varies by oven, so check them often! Cool in pan for 5 minutes. Remove to racks and cool completely before frosting (If I have time, I like to bake the cupcakes the night before, frost the next morning). I made an apple pie for Thanksgiving, but I had to have something pumpkin, too. These are great for fall and into winter holidays. The pumpkin makes the cake so moist. People have loved these every time I’ve baked them, from office parties to family gatherings. Double the recipe below for a “normal” batch, I wanted the just nine that this made. I was given these cute pumpkin wrappers a few years ago. I was happy to finally use them! 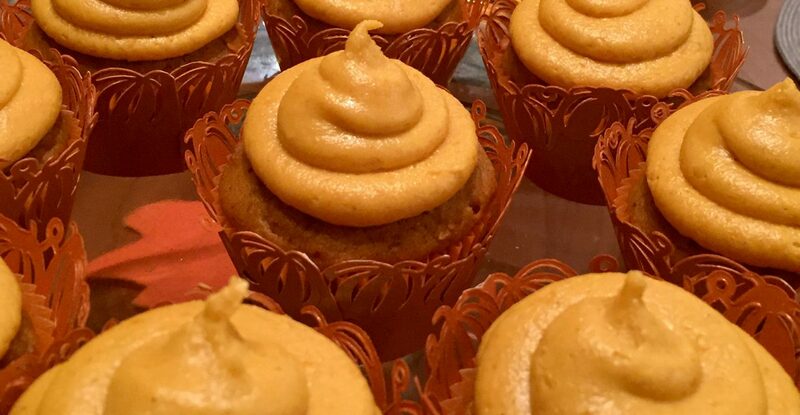 I’ve done these before with cinnamon icing, but I decided to double down on pumpkin. 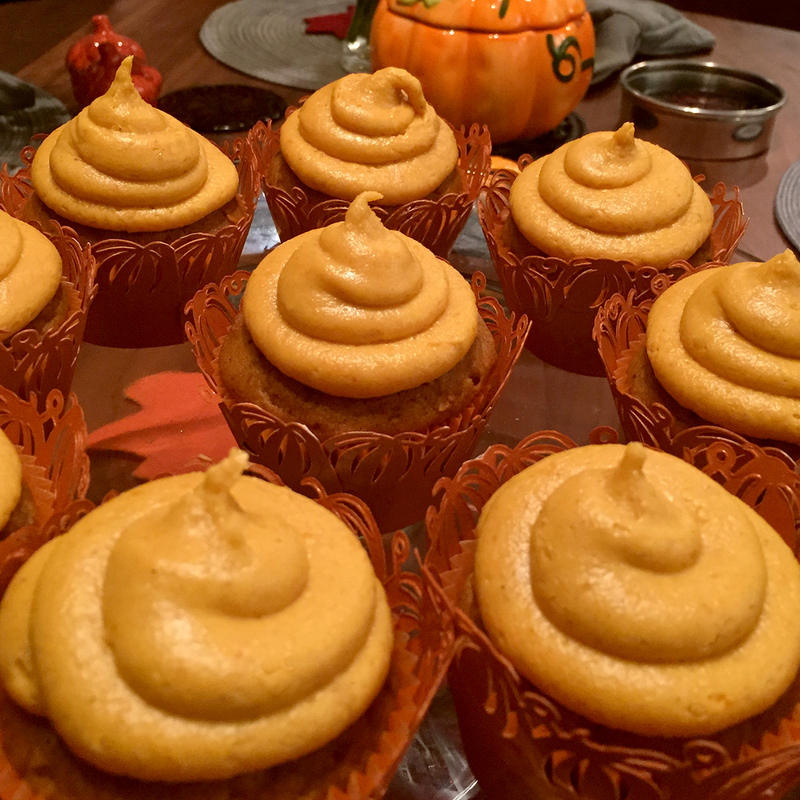 I was worried that the frosting wouldn’t work out, the butter and pumpkin did not cream together as one recipe I saw describe them as doing. It worked out once I started adding the vanilla and powdered sugar, though! Preheat the oven to 350° F, and line your tins with 9 liners. Beat the butter and two sugars on medium until creamed. Add the egg. In a separate bowl, sift together the flour with the baking powder, baking soda, and spices. Add the vanilla extract to the buttermilk. Alternate adding the wet and dry ingredients until just combined, then mix in the pumpkin purée. Scoop into tins with a ice cream scoop or your preferred method, filling about 3/4. Bake for about 22 minutes, turning halfway through. Cool for 5 minutes in pans, then cool completely on a rack before icing. 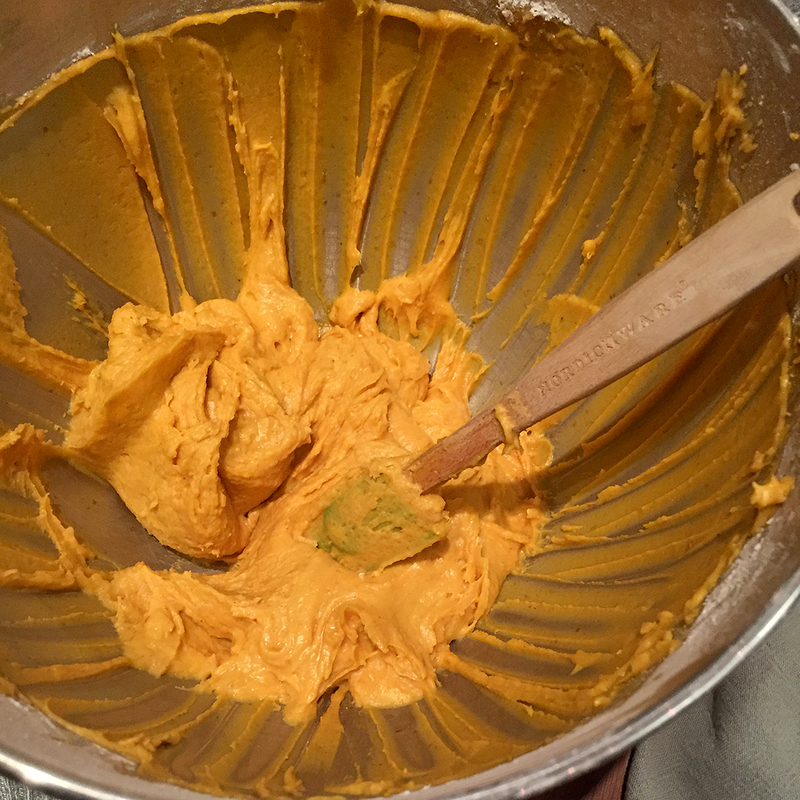 For frosting: Beat together the room temperature butter and pumpkin purée until as smooth as possible. Add the vanilla and spices. Slowly add the powdered sugar, mixing well.